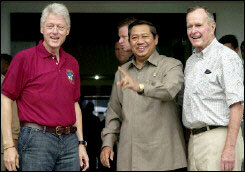 Former U.S. Presidents Bill Clinton and George Bush, Sr., visited the Aceh province of Indonesia on February 20th. The former presidents met with Indonesian President Susilo Bambang Yudhoyono and toured the devastated region. Aceh was the worst hit region in the world by the tsunami. Over 200,000 people were killed and innumerable building and homes were leveled, leaving many of the survivors homeless. Clinton and Bush were able to view the extent of the devastation firsthand as they flew over some of the worst-hit areas of the province in a U.S. military helicopter. “I've never seen anything like this in my entire life -- ever," said Bush. He told villagers who greeted him that, "You're going to be okay. A lot of people around the world want to help." The extremely poignant story and plight of Raymayadi is, sadly, very common among the inhabitants of Aceh: He has lost almost everything, many of his family members, his house, and his belongings; but he endures. “My children and wife died and I didn't get their bodies, so now it's only me and two sons," he said. "All we ask for now is shelter because we can't live in tents forever. I will keep being patient until someone helps me."